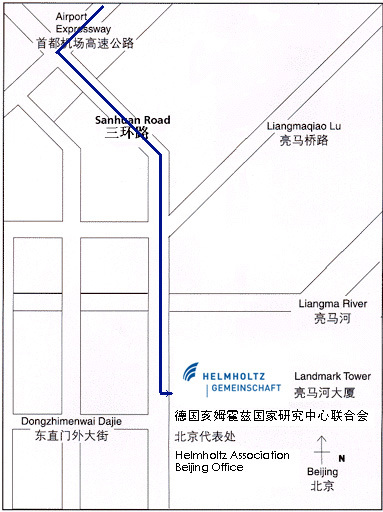 The Helmholtz Beijing Office represents the Helmholtz Association in China. Its mission is to further promote cooperation between the scientists from the 18 Helmholtz Centres and their partners in the Chinese scientific community. The emphasis of this cooperation lies on strategic and long-term projects in the six research fields Energy, Earth and Environment, Health, Information, Structure of Matter and Aeronautics, Space and Transport. The Beijing office aims to build a bridge between Germany and China by intensifying communication and increasing understanding. China has a fast growing economy. Not only its vast natural and human resources, but also its increasing scientific and technological potential makes it an important strategic partner for the Helmholtz Association. Over the last 20 years close relationships have been established between Helmholtz researchers and partners from Chinese institutions, among them numerous institutes of the Chinese Academy of Sciences, universities, clinics but also government institutions. In order to further strengthen these existing contacts the Helmholtz Beijing Office provides specific information about China's policy, its workforce, academic opportunities and research projects for partners in Germany. With regard to Chinese institutions, the Beijing Office wants to promote the Helmholtz Association and its outstanding research environment and facilities as an attractive location for the training of young scientists as well as for senior scientists wanting to pursue innovative research ideas.